Have you ever wondered just how that Local Honey at your market makes its way from hive to bottle?Come visit our small sustainable apiary/Bee Farm and find out. 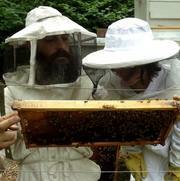 We are a small micro farm keeping 60+ beehives. When visiting our farm you can expect to tour our apiary and Honey House. Take a walk and see our vegetable gardens, chickens, shiitake mushroom logs etc. We are even offering a tour of our Off Grid/Solar powered home. There is something for everyone at Bee Kind Family Farm! Directions: (from Blowing Rock) Take the Blue Ridge Parkway approximately 16 miles south (towards Linville) to Roseboro Rd. Roseboro Rd. is NOT marked- ­ it is the next crossroads just after the 221 Grandfather mountain exit. Take a left on Roseboro Rd., (mostly a gravel road) ­ and travel for 9 miles. At the stop sign, take a left, Bee Kind Family Farm is about a mile down on the right. Crow Hollow Farm is a young, growing operation on 35 acres. The centerpiece is a 115 year old farm house undergoing restoration. We raise sheep for ourselves, and sell to local restaurants. We also have fresh eggs. This year, we are starting mushrooms and berries. In addition we forage wild greens, mushrooms, fine hardwood lumber, and other gifts that the mountains provide. Friends and neighbors are the support and partner in different areas of the farm. 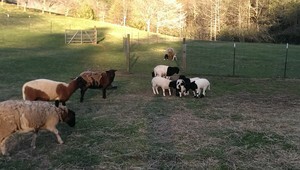 Come see us, try some lamb, and enjoy the bounty that we share. Directions: (from the intersection of US Hwy 321 and US Hwy 64/18 Smith's Crossroad) Follow 64/18 W one block and continue on it as it turns left becoming Morganton Blvd SW. Drive 2 1/4 miles and turn right onto Harper Rd., just past Food Lion. At the second light (3/4 mile, Citgo on left) turn left onto Abingdon Rd. Drive 7 miles to the end of Abingdon Rd. and turn left onto US Hwy 90. Crow Hollow Farm is 6 miles on the right. Look for the yellow farm house with red gables. Come visit our small scale farm and tour our vegetable gardens, meet our flock of hens, and visit our self-service roadside stand. We grow vegetables, berries, and cut flowers and we also have a small apiary. Meet the family and learn how we manage our farm on a small plot. Directions: From Boone, take 321 south to the intersection of 321 and hwy 268 in the Happy Valley area, north of Lenoir. Take a right on Warrior road, then the first right on Coy Miller Rd. Our farm is about 1/4 mile on the left. Come experience the Patterson School Foundation’s regeneration of the land, campus and legacy of Samuel Legerwood Patterson, the first North Carolina Commissioner of Agriculture. He was credited by Ashe, the biographer, who wrote that he ‘contributed as much to the agricultural development of North Carolina as any man in its history’. Tour Palmyra, the family plantation home which became the first Patterson School building, and it’s newly established incubator farm. Mr Patterson would be proud! Directions: Head south west on Edgewood Drive toward Councill St, then follow US ­321 South to State Road 1560 in Patterson for 20.2 miles. Follow State Road 1560 to NC 268 East, which is the same as Patterson School Drive for 4.6 miles. You'll pass our large red barns on the right and you'll turn left into the campus soon thereafter, on 4646 Patterson School Drive.